OK, hands up, who hasn't heard of Angry Birds the phone app? Now the popular app has gone reality (as opposed to virtual!) in board game style with the arrival of Mattel's Angry Birds Knock on Wood Game. In the phone app game, the greedy green pigs steal the bird eggs - and the understandably angry birds want their eggs back. They go after the pigs by being shot at them via a big catapult, and knocking down the pigs' temporary shelters, intended to keep the pigs safe. With the board game, the goal is still the same - tear down the structures and take care of those pesky pigs! The fight between the birds and those pigs continues to rage on in this game of patience and strategy. In this fun boardgame versions, the players create real structure from the blocks provided and then attempt to destroy those structures with those flying flung birds. To start, players take a card and then create the structure that the card tells him to build. Once the structure is finished, the next player gets to launch his bird at it in an attempt to smash down the structure and advance in the game. The basic premise behind the game's goal is similar to the application version. 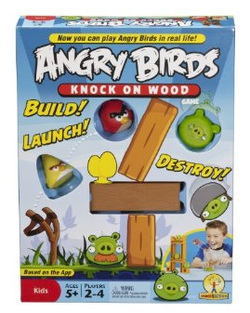 By using the birds in Mattel's Angry Birds Knock on Wood Game, each player (the game supports 2 to 4 players) has an opportunity to advance to the next level by destroying the building created by the other player. The cards have different building levels on them, and when players reach the fourth level, they're introduced to the ability to build a structure of their choice rather than following a card. Each card (and each structure) gives the players the potential for a certain number of points they can accumulate. The tougher the card, the more points that are available to get. The bird launcher is used to launch 1 of the 3 types of Angry Birds at the structures that's housing one or more of the 4 pigs - and players can earn a bonus star or bonus egg. The Mattel Angry Birds Knock on Wood Game is a rapid paced game that will raise the stakes as one player tries to build his structure before his opponent sends an Angry Bird to stop the progress! The game includes 3 of the popular Angry Birds, the green pigs, a launcher in the shape of a slingshot, the pieces to build the structures and the mission cards. Just in case you were wondering, the board game is indeed as additive as the phone app game and will give your family hours of fun and laughter.